It has been a super busy week, so my blog is late. I spent a great deal of time sewing this week, but the time I normally use for blogging was crowded with other commitments. Finally, finally, I finished a quilt I started months ago. It sat in my closet minus the binding and the label since last fall. It’s one I constructed in Amy Gibson’s Craftsy Secret Garden Workshop. The fabric is Amy Butler’s Belle. The pattern is disappearing nine patch. 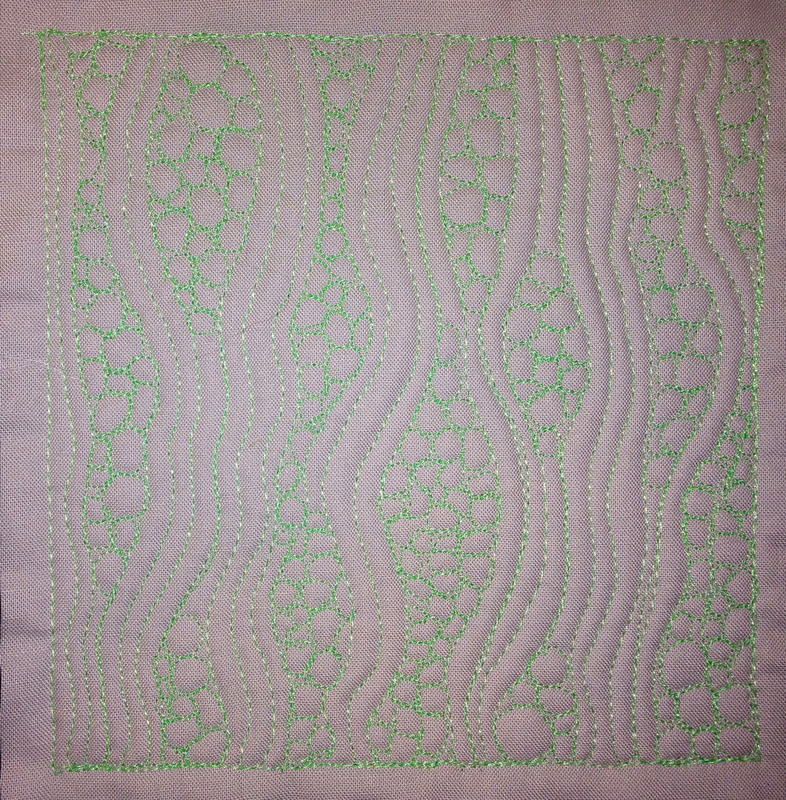 I free motion quilted it with Leah Day’s Free Motion Fillers, Volume 1. Using a layer cake made cutting and piecing very easy. I had the top finished in a week and it took only a couple more to quilt it. Christmas projects took over my schedule. Now it’s done, and I can mark off another UFO from my list. I also worked on my block for Leah Day’s Building Blocks Quilt Along. This week’s block worked script into the design. It was relatively easy, but fun. Binding this little quilt is next on my list. I probably should be embarrassed to mention this, but I found a wonderful little app for my iPad, The Quilter’s Little Helper. It’s free. Robert Kaufman Fabrics offers it. It’s packed with specialized calculators for various parts of the quilt. Calculating yardage for borders is definitely not rocket science, but I use the app as a check. It has calculators to convert inches to yards, backing and batting, piece count, pieces to yardage area, binding, border yardages and a couple of others. I found it in the iTunes Store under QuiltingCalc. Another tool that has made binding a breeze for me is the Binding Tool from Missouri Star Quilt Company. This little piece of plastic helps make the end of your binding almost invisible. There is a trick to using it, but there are full instructions on You Tube to walk you through the process. I have the materials for three different quilts and am really conflicted about which one to start next. I guess I’ll take them in the order of difficulty. One of them requires cutting a bazillion blades for Dresden Plates. I’m thinking of leaving that one for last, although I’m really looking forward to seeing that quilt on one of my beds. This week I’ll get April’s pattern for the Sugar Block Club so I think I’ll have plenty to keep me busy. 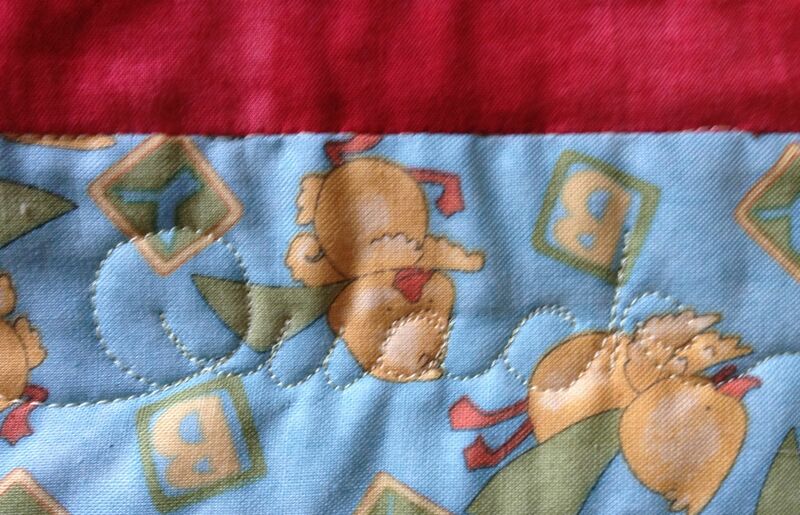 This week’s pattern for the Building Blocks Quilt Along offered us a challenge that is new to this quilt along. We were to free motion quilt most of the block, but there were two rows of quilting that Leah instructed us to do without the benefit of the lines. 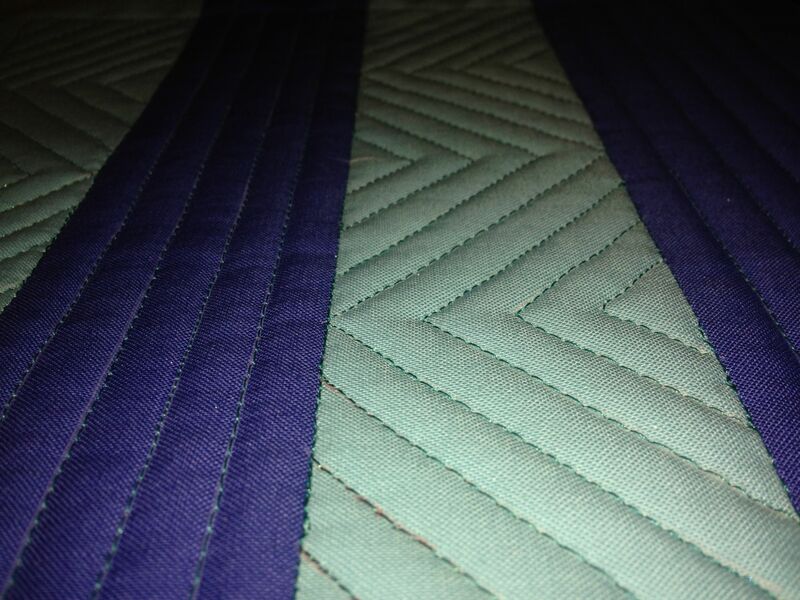 I knew this was going to be interesting because it’s difficult for me to quilt consistent wiggly lines. 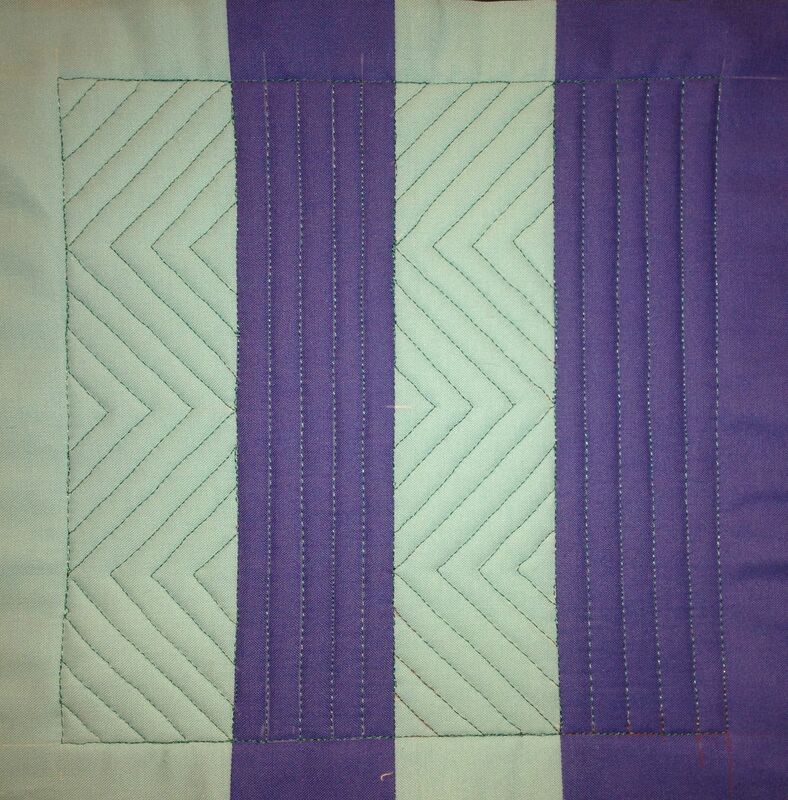 With this in mind, I quilted the usual practice block that I do every week before I quilt the actual block. 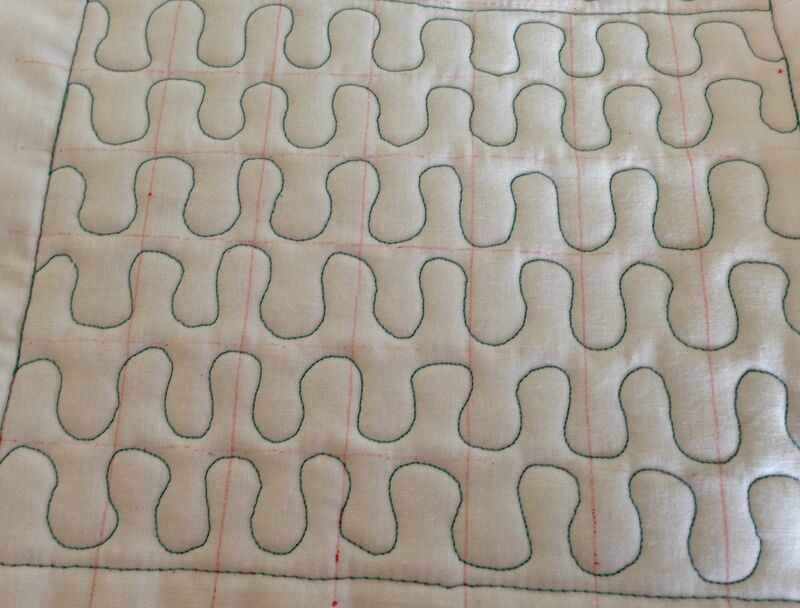 Since I used a frixion pen to mark my fabric, I was able to quilt the lines and leave those that were to be quilted freehand undone. I steamed them out and did the two rows without markings. I needed more practice. I could manage the “teeth” but the “wiggles” were another issue. 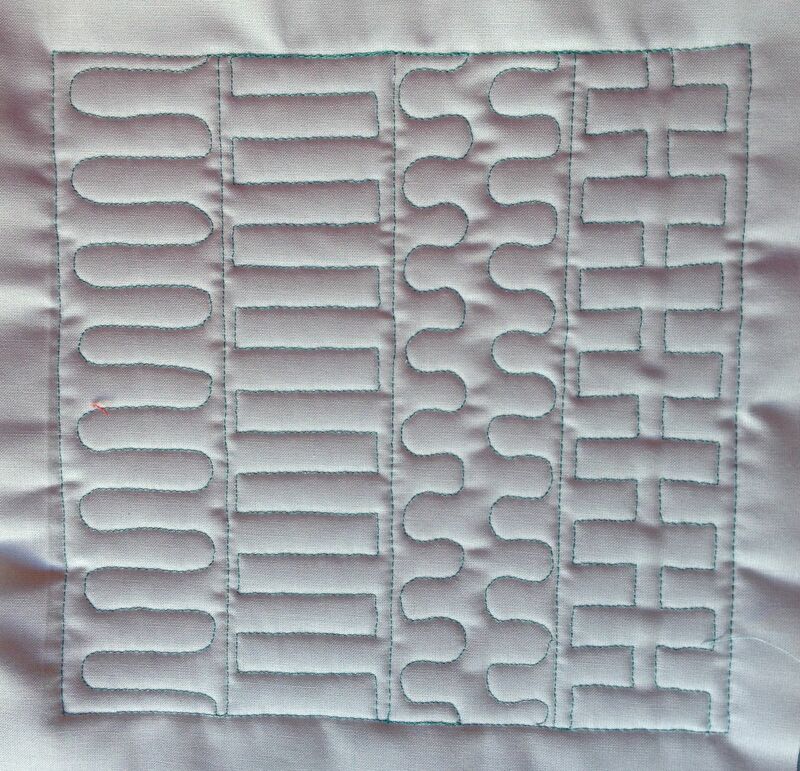 I used some of my practice squares that I keep on hand and drew some one-inch grids and stitched several lines of “wiggles”. 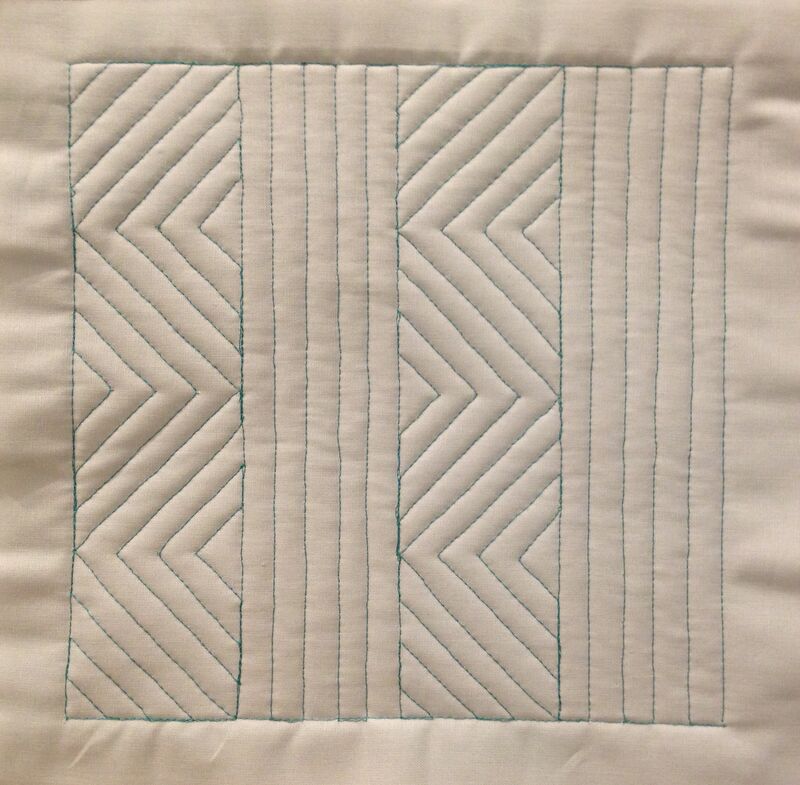 It was difficult to get consistency until I remembered that in Leah’s video she said to visualize your fingertip as you quilt wiggles. That really helped. When I was comfortable doing these lines, I turned to my “for keeps” block. 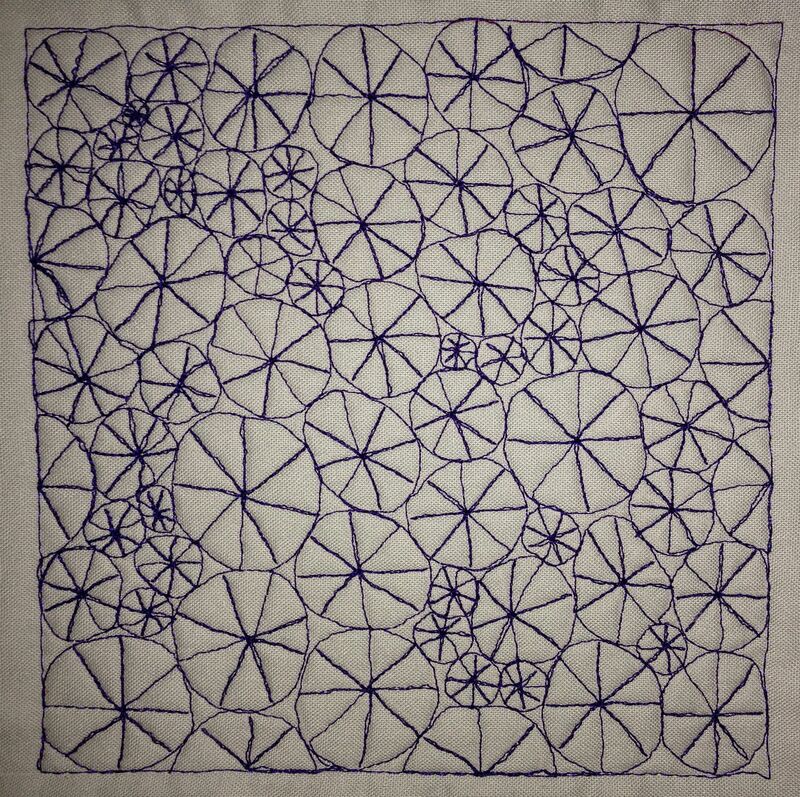 I stitched everything except the two lines and deleted them with steam. Then came the free-hand lines. I had no guidance on the lighter fabric with the teeth, but unfortunately, on the darker fabric there were ghost lines to help me along with the wiggles. For the past two years I have subscribed to Amy Gibson’s Sugar Block Club. Each month Amy posts a block pattern along with one of her delicious recipes. What could be better? Last year I just collected patterns and recipes. This year I’m catching up. I’m not sure why I did this, but… I also decided to do two blocks of each pattern. I’ll be making one GIANT quilt or more practically, two quilts next December. I fell in love with Moda’s French General fabric line and purchased a layer cake of the Josephine collection. I had no idea what I was going to do with it. I just wanted those fabrics that were named after me. (My given name is Josephine.) How silly! I decided to start the year using those fabrics for the Sugar Block Club blocks. I’ve been filling in with fat quarters that were on sale at our local quilt shop. As of this week, I’m current. (Bravo!) Since I’ve had little experience cutting and piecing, this has been a real challenge with a couple of blocks. The block from February 2013 was the block from hell. It took me an entire day to piece it. My blocks aren’t perfect, and I’m way out of my comfort zone, but I’m learning. And it’s fun! Amy gives each block a title and you have to read her blogs to understand the significance. Here’s a gallery of my efforts. 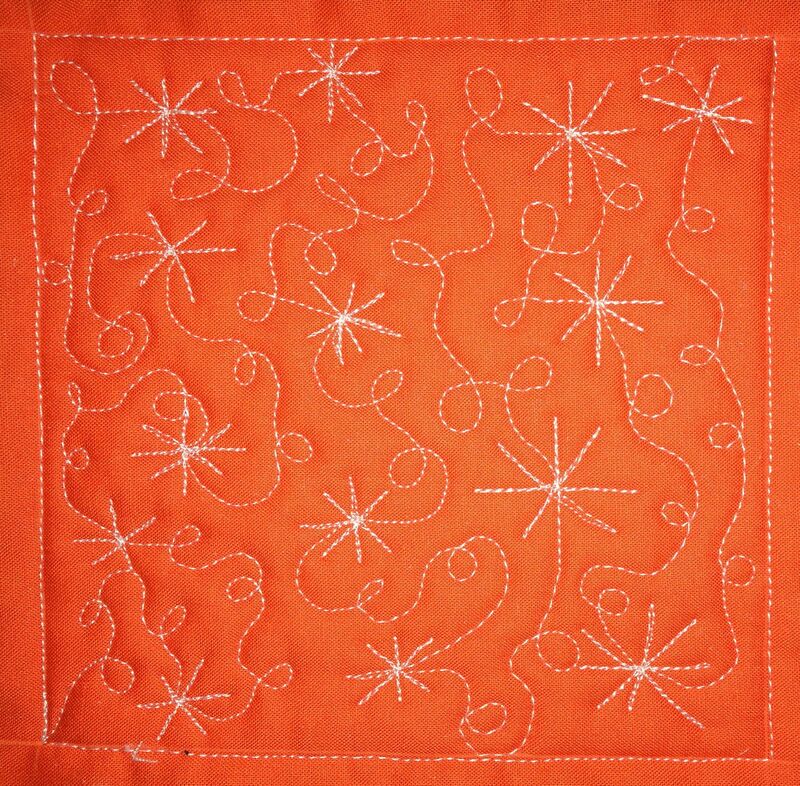 I’m linking up with Leah Day’s Free Motion Quilting Friday Link Up. Sometimes things just don’t work out the way you plan them. 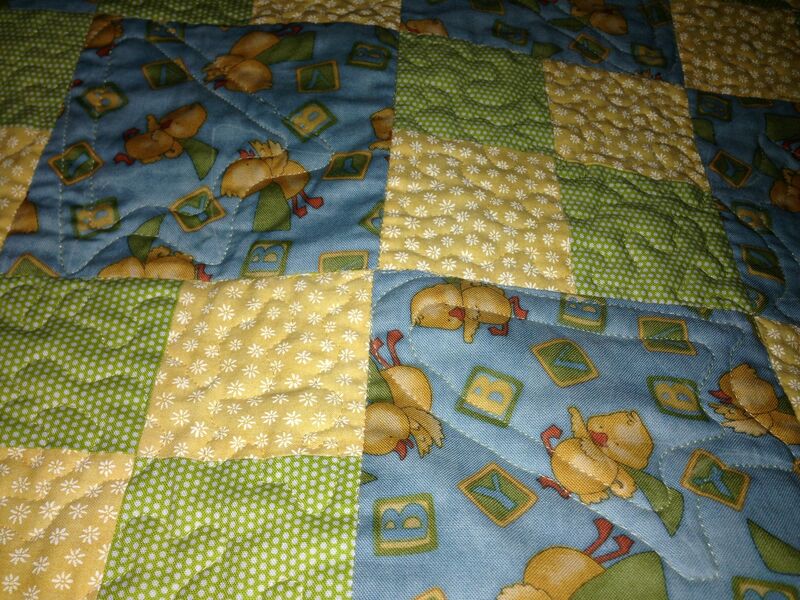 I spent the good part of this week figuring out how to put duck tracks on a baby quilt I was finishing. I even researched duck tracks on the Internet to get as close an interpretation as possible. I drew the tracks in Adobe Illustrator so I could scale them, got a good template, and marked the quilt. I had to place them so they looked like a duck was walking back and forth across the quilt but I also had to make sure that the tracks were touching the edge of each block so I could travel from block to block without breaking thread 18 times. 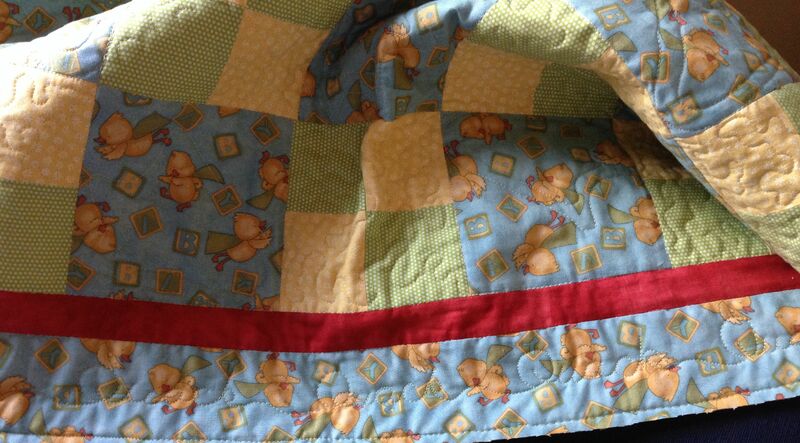 I quilted the duck tracks and much to my disappointment, you can barely see them. I’m tempted to rip them out, but that would mean ripping all the stitching out. Maybe I’ll figure out a way to fix this. In the meantime, I’m putting it aside and will finish it after I take a break from it. 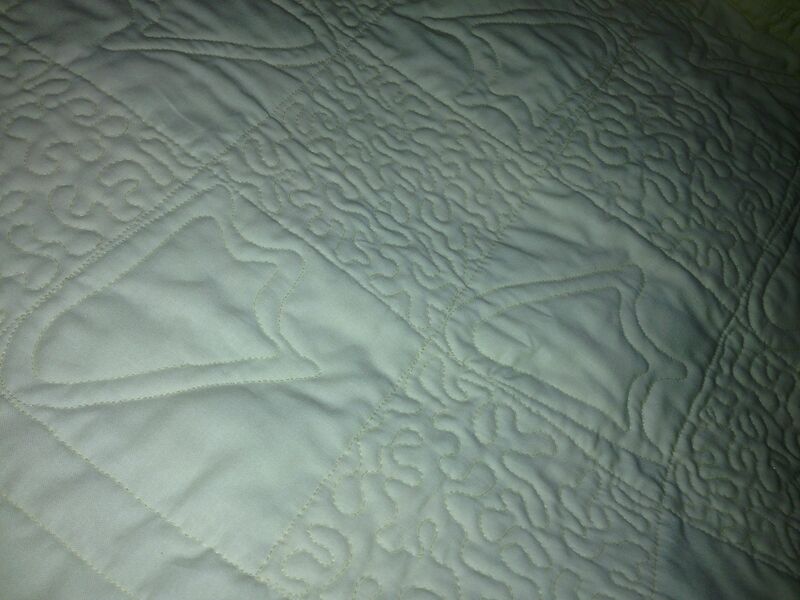 So… if you look closely at this quilt there is a possibility that you may see some duck tracks. I finished Block 3.1 for Leah Day’s Building Blocks Quilt Along. It was a nice exercise for straight lines and travel stitching. I’m feeling better each week about my free motion quilting, but I’m finding that it is so much more difficult to be precise on a larger piece like a baby quilt. 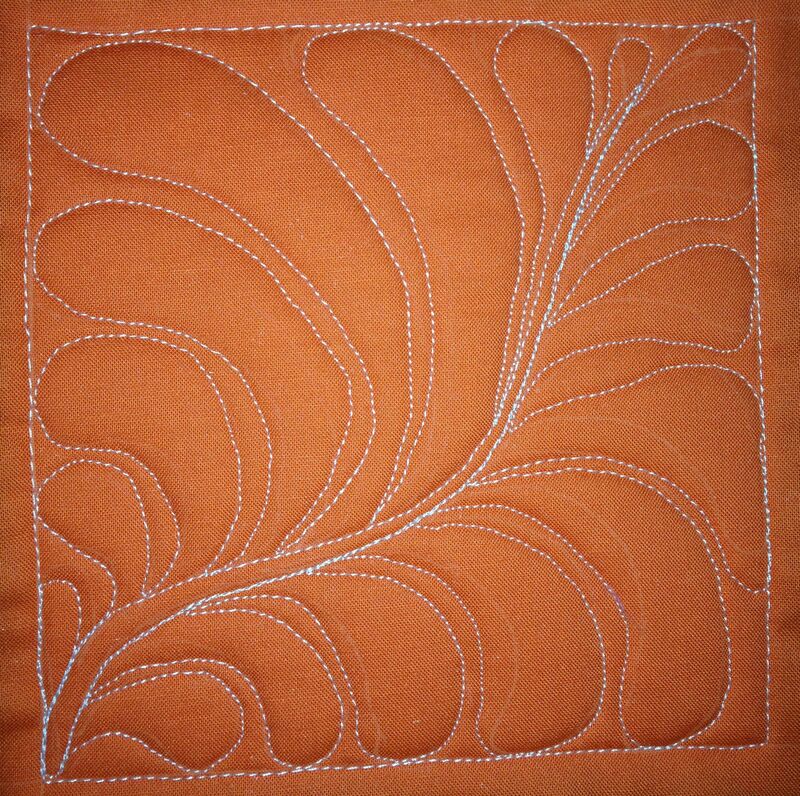 Here’s Leah Day’s free motion quilting design #429, Jagged Flame, designed to fit into quilt sashing. Next week I’ll finish piecing the March blocks for a block of the month project. I got a good start on them this week. I’ll get back to stitching some more of Leah’s fmq designs. I’m also planning on binding a larger quilt that I finished a while ago. I’m trying to clean these projects up so I can go on to new adventures. This was a busy week. Much of my time was spent learning complex software for the embroidery module for my Bernina 830. I’m approximately two-thirds of the way through the workbook and it is amazing what it can do. The package is loaded with features. I love that it includes a version of Corel Draw. I can’t wait to start designing. Almost anything can be digitized and turned into embroidery. I have two quilt projects that involve machine embroidery and I want to understand as much as I can before starting them. Last year I joined a block of the month club. I was so busy that I let that fall by the way. I rejoined this year and have managed to keep current with 2014. 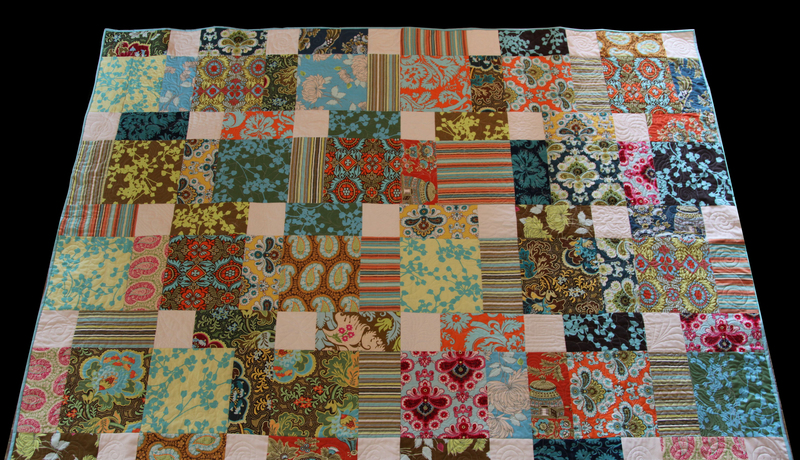 I have decided to combine the blocks from both years and make a double-sized quilt. I did a lot of cutting this week and everything is cut and some blocks are pieced for January through March. I’ll have the first three months for both years pieced by the end of this month. The third series of blocks for the Building Blocks Quilt Along is cut, pieced, and marked. I also made muslin practice blocks for each design. I’m just waiting for Leah’s instructions in the beginning of the week. I’m looking forward to that. 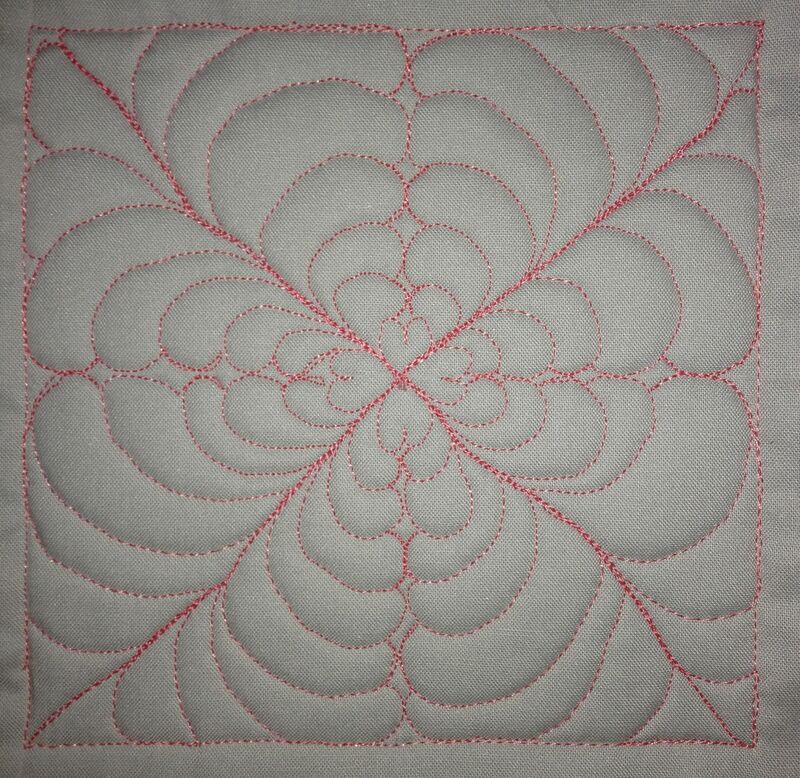 In the meantime, I did a little free motion quilting practice. 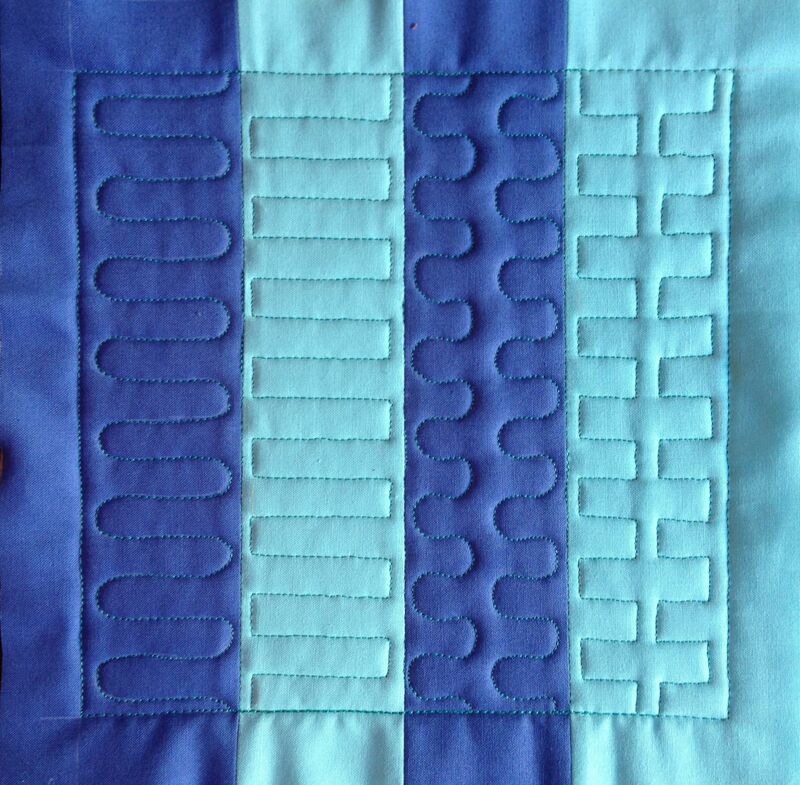 I want to stitch all the new designs for the Free Motion Quilting Project. (Thank goodness there is no deadline on this!) I am working backwards and have thrown a couple more designs in just for fun. I noticed this week that working with light thread on dark fabric makes your stitches pop more than if you use dark thread on light fabric. I really struggled doing #428 Basic Star. Space Feather (#420) was a little challenging also. In the coming week I’ll quilt my philanthropy quilt and have it ready for binding by the time quilt guild meets. 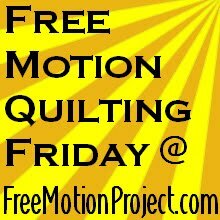 I’m linking up with The Free Motion Quilting Project Friday Link Up. Until next week, Happy Stitching, everyone!